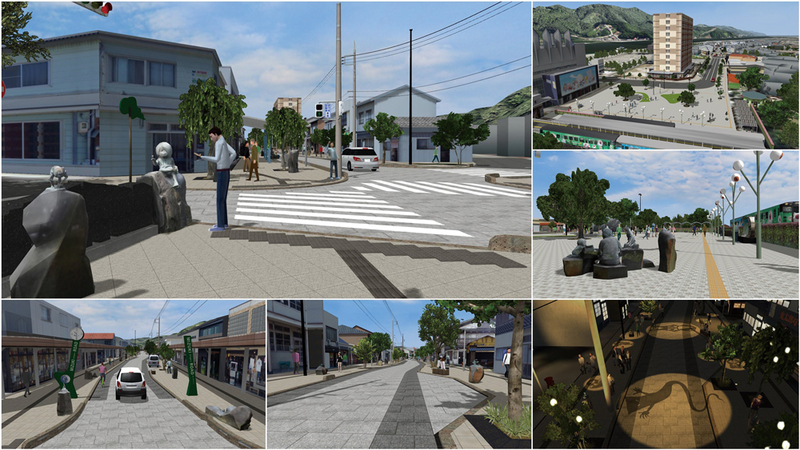 "Mizuki Shigeru Road in Sakaiminato City"
A renewal plan of Mizuki Shigeru Road has been promoted in Sakaiminato city. We created VR for PR and a consensus of the design plan. We generated 3D models from photos of 153 complicated shaped bronze statues, which are the major characters of Mizuki Road. Mystery Forum 2016 held in September, VR Kitaro on Roll of Cotton navigated the city and showed the concrete plan to persons involved and citizens. Running the script animation "Mizuki Shigeru Road renewal plan", you can view the flow of the largest renewal plan with a narration. Let's go to see 150 bronze statues together with Kitaro riding Roll of cotton. The animation starts from JR Sakaiminato station and has a lot of sights to be seen such as safe and wide sidewalks expanded at the time that the road became one-way, streets filled with Showa-era atmosphere, each yokai monster zone, the way to Mizuki Shigeru Memorial Hall. At night when yōkai monsters are most active, they appear as shadow puppets on the road and sidewalks attracting a lot of attention from pedestrians enjoying the walk. "Fushimi Technical High School, alma mater that is passed down the generations"
Fushimi Technical High School and Rakuyo Technical High School have been integrated and restarted as Kyoto Kogakuin High School this year. Although a new evening high school will be built in the lot after Fushimi Technical High School, most part of the school building will be torn down. We have decided to bring down the current building as 3D data by using the knowledge and skill about civil engineering that we are learning. In an animation "Fiscal year 2016", you can see passion of students who long for their alma mater, innovative idea of reproduction in 3DVR by using multi-copter, and students flexible ideas and expressions everywhere in their work. This data consists of an easy flow of such as background of VR creation, problems and answers, walk-through school introduction, and future usage of VR. Each structure and landscape inside the school are also reproduced well. You can catch the enthusiasm of the Technical High School students from detailed creation of the building roofs and compressor units by using advantages of UAV characteristics. 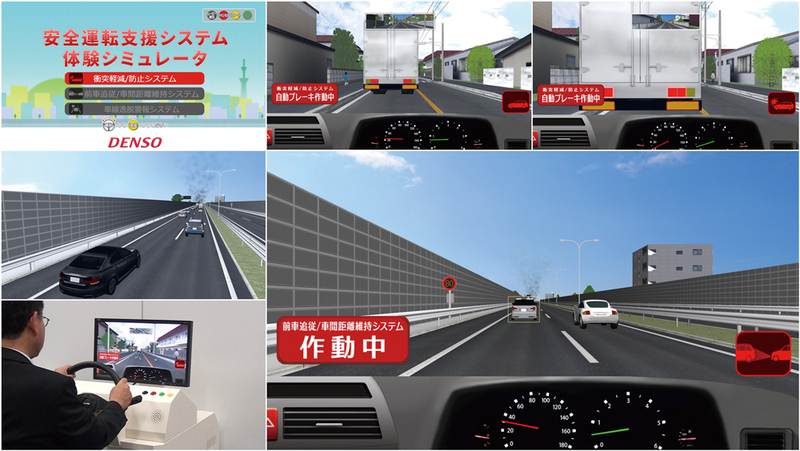 "Experience simulation of ADAS features"
VR data for DS that users who have not introduced an ADAS system can experience it. Specialized features and a scenario feature has reproduced "Pre-crush safety system", "Adaptive cruise control", and "Lane departure warning". You can experience ADAS (Advanced Driver Assistance Systems) by 3 scenarios: PCS (Pre-Crash Safety System), ACC (Adaptive Cruise Control), and LKA (Lane Keeping Assist). You can see the replay of your driving after the experience. It's just VR, but a system window display and warning tone increase its reality. You can also watch a explanation movie of each system in the ADAS_Movie scenario. "Education system of rapid evacuation from tsunami"
An evacuation education system that we can learn how to escape rapidly from the area where a tsunami is predicted to come following the seabed earthquake. 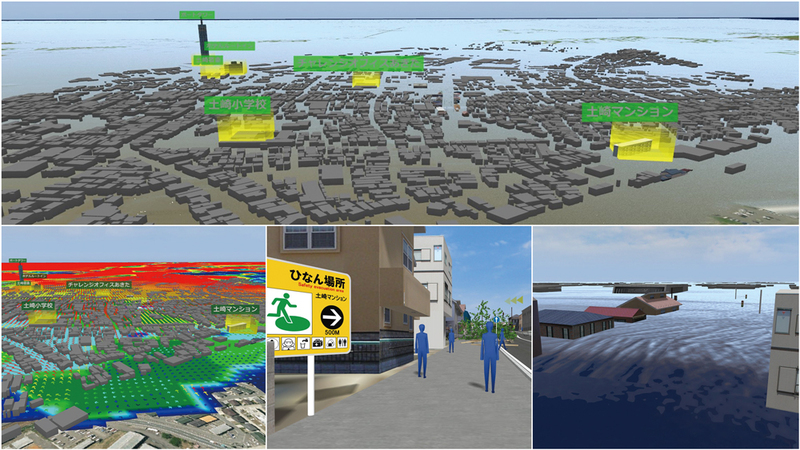 This system has affinity for residents in Akita city because the cityscape of inundated areas in the city is created in VR and they can experience how tsunami flows up to the city. We will utilize this system for enlightenment activities of tsunami prevention in whole Akita prefecture. Running the animation "Simulation for education of rapid evacuation from tsunami", you can see the description about an overview of this system and future vision. It shows the immersion range based on the tsunami analysis result and reproduces streets familiar to residents in order that they can feel a sense of crisis closely. This is an education simulation system that tells residents where and how tsunami comes, gives them an idea of routes to tsunami refuge buildings when there is no upland, and urges them to evacuate rapidly. The purpose of this simulation is to establish an education system that can be utilized for disaster prevention from this region to the whole area of Akita. "Works expression in Obama Center Competition"
A decision making process and an innovating works expression utilizing VR-Cloud® shown in "Obama Center Competition" on the architectural cloud sourcing site Arcbazar. 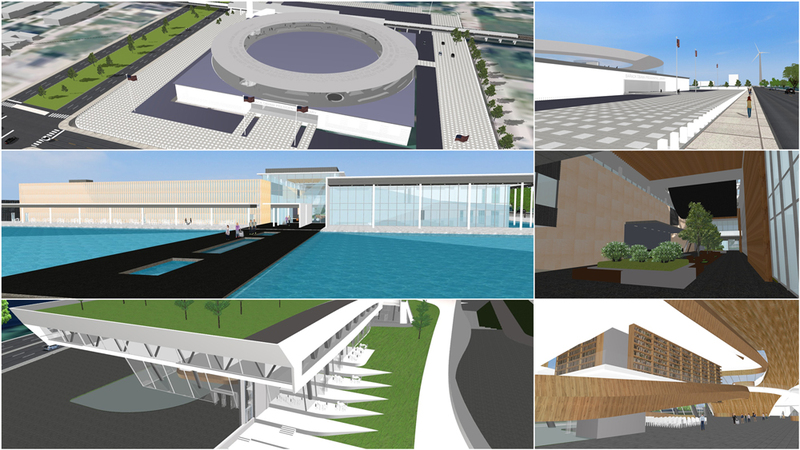 Applicants used drawings, perspective drawing, and VR-Cloud®. Juries and general voters experienced the works via VR-Cloud® and utilized it for the evaluation on Arcbazar. You can touch works of 3 architects. Scripts set in each work lead you into whole picture of a virtual memorial center. You can see the appearance of the center in a plan view, indoor walk-through, and from ground view. When you pause the script and look around in the details, you may find feelings of the architects. It can be said that all of the works are the highlights. 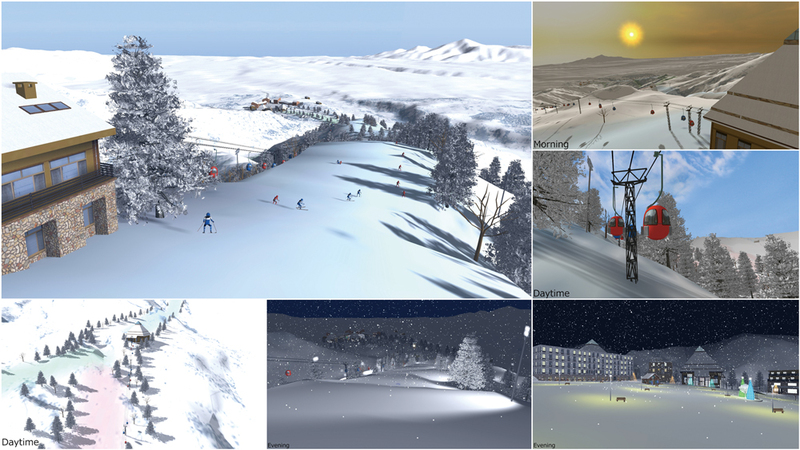 "Facility planning of a ski field considering user's viewpoint"
Using VR efficiently, in a planning of a new ski field, we consider the change of landscape according to the movement of skier's view. Particularly, we verified shift of internal scenery whilst skiing by using VR head set (Oculus). In addition, we planned lighting arrangement in the night; night skiing and at the time of events like Christmas. By executing a "script for contest", you can thoroughly enjoy ski resort sceneries such as the rising sun, daytime landscapes, view from a ski lift, and the scenery during skiing. Although this is a VR data, viewers never feel bored with the beauty of a snowy world, charms of ski like a turn and a feeling of floating, and the fantastic lighting at night. "Evacuation training and experiment in the chemical industry precinct by using walking VR simulator"
VR data of an emergency evacuation plan preparing for chemical spill accident. A walking evacuation in a large data area can be experienced with a HMD. The purpose of this simulation is to make an evacuation plan by examining the evacuation time and the recognition of evacuation signs. This is expected to be utilized to train people living near the chemical industry parks and workers, and to be applied for another evacuation like earthquake and fire. You can check whole landscape in the camera position 1. 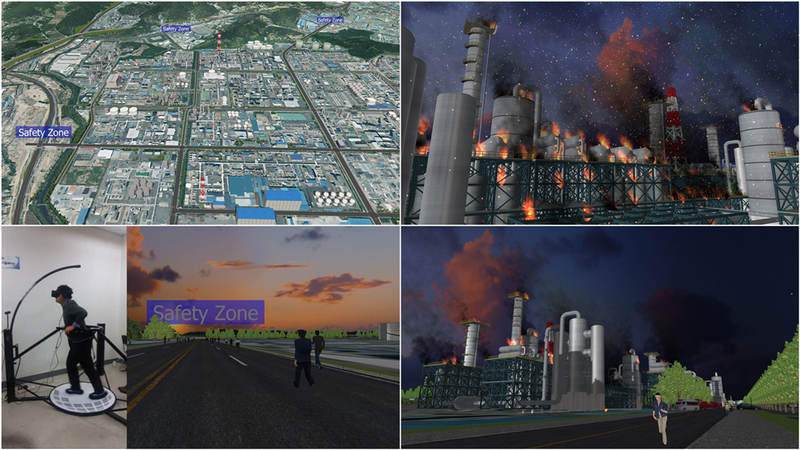 When the script "Fire" is run, fire simulation in chemical factory is displayed, and residents and workers models start to evacuate to 3 safety zones. The scene that ambulances and fire engines rush to the scene of the fire reproduces the actual evacuation plan more realistic. "Departing and gathering traffic simulation of large traffic core"
An experiment linked with driving simulator for the design of Lanzhou large railway in Silk Road, western China. The first key point is a space layout rationality of large 3D traffic instruments, and the second key point is a reproduction of a driver reaction efficiency under the complicated traffic environment. We provided technical support for the promotion of the large-scale projects. 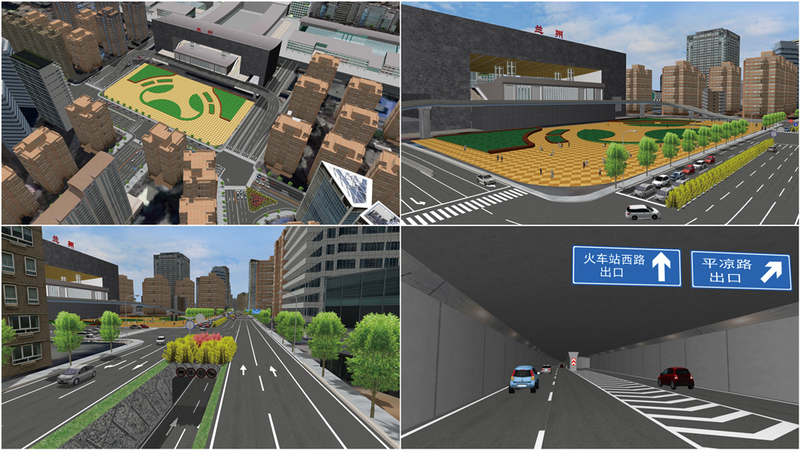 Making a circuit of saved view points, you can see Lanzhou station, east-west underpass to reduce traffic jam, intersections, and road signs used for a verification. A script introduces this large project from the both view from street on the ground and underpass. You can also see that the station square design has been renewed. "Simulation of bridge girder construction via overhang construction technique"
A simulation visualizing the work flow of bridge girder construction. A CAD model was upgraded to a 3D model with movement algorithm assigned to simulate the work flow of bridge girder construction via overhang construction technique with construction machine in full motion. Movable steel bars in 3D pier models are viewable from all angles, which makes this whole 3D VR environment ideal for CIM (Construction Information Modeling). 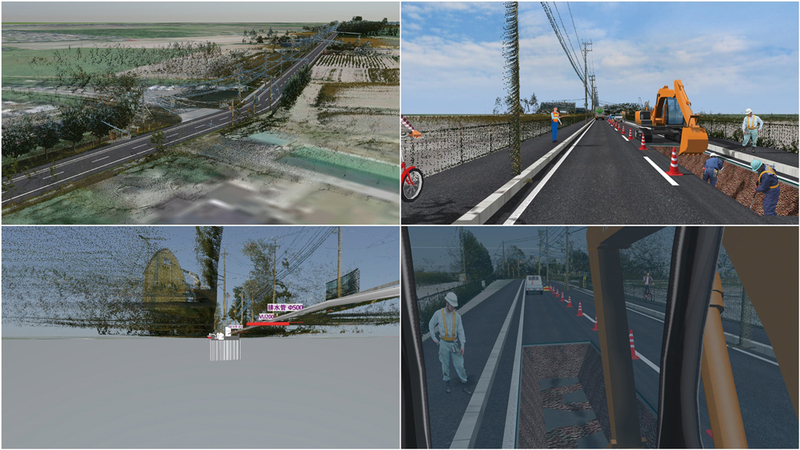 The 3D environment with a completed bridge model can be navigated around to assess landscape and aesthetics surrounding the bridge or confirm visibility from driver's perspective. In an animation "reinforcement construction", a construction simulation is described as the linkage from CIM support design CAD/3D bar arrangement. Construction of the bottom of elevated bridge such as a foundation pile, reinforcing bar erection, concrete placement, and pier construction can be checked from up close. 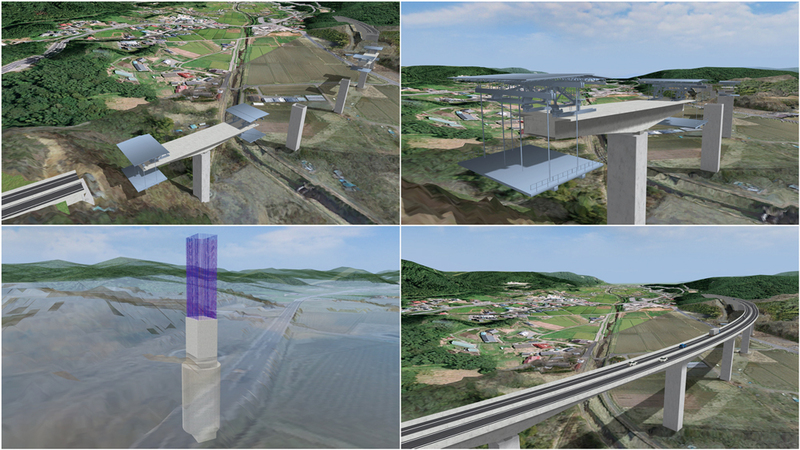 Another animation "Construction_whole bridge" is the 4D construction simulation. Separately exported 3D models have been set up to move, and maintenance vehicles (wagen) carry out the overhang construction. After finishing the construction, you can drive on the bridge to check the view from the vehicle. 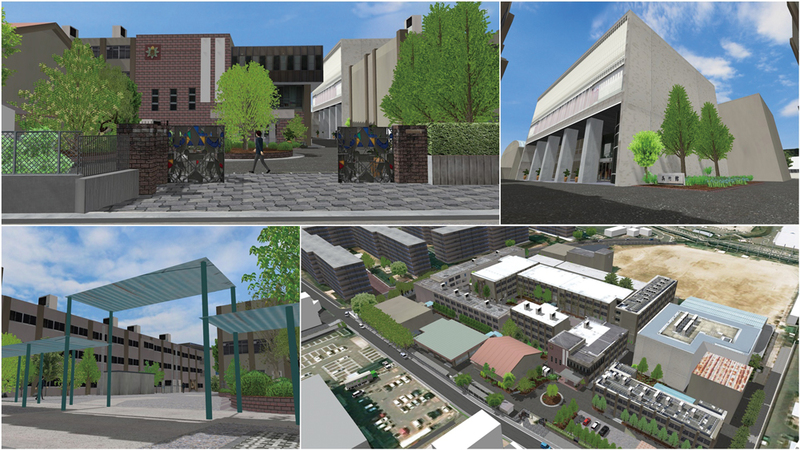 "Society infrastructure VR - production improvement by CIM"
VR of sewer work under Sapporo urban area. The site is reproduced by integration of point clouds acquired by MMS, new sewer model, and existing buried pipe model created from prospecting survey result. It contributed to informing proper heavy machine arrangement plan at construction planning or meeting with consideration of surrounding facilities and to lifeline accidents prevention. In addition, we gave workers training on safety with HMD about dangerous points while at work. This intelligent initiative to boost production rate in the construction phase through the exploitation of VR technology and point cloud is the ideal solution to today's unprecedented growth in demand for a more effective approach to maintenance and management of aging social infrastructures. You can see a series of sewer construction works by playing one animation in script. In a plan view of VR space with point crowd, you can check eye lines of car drivers, heavy equipment drivers, and excavation workers as well as work place and pipes installed underground. Especially, the underground data is well-created, and drainage pipes and water supply pipes are modeled precisely.